CENTURY CITY, CA -- August 24, 2000 -- Remember your first time? It began as a little-known experimental London stage production, bombed in movie theaters when initially released and went on to become a massive underground hit and international pop culture phenomenon. And now, Twentieth Century Fox Home Entertainment celebrates the 25th anniversary of the original, interactive midnight sensation, THE ROCKY HORROR PICTURE SHOW, by releasing the acclaimed one-of-a-kind feature for the first-time-ever on the ultimate interactive home entertainment format, DVD, and on VHS, both in fantastic 25th Anniversary Editions, beginning October 3, 2000. The longest running film in history, a rock and roll classic that defined in-theater interactive entertainment, the out-of-this-world ROCKY DVD debut is loaded with hours of extras including sing-along songs, a DVD-ROM Juke Box, DVD-ROM interactive games, commentaries, a stimulating participation audio/sub-title tracks that bring the unique interactive experience home - and is packaged with rarely seen production stills and photos that have never before been published or available. This two disc DVD is priced at $29.98 U.S./$37.98 Canada (S.R.P.) and $14.98 U.S./$16.98 Canada (S.R.P) on VHS. The retailer pre-order date is August 30, 2000. Come Up To The Lab and See What's On The Slab! To support one of the most highly requested DVD titles of all time, Fox has launched an exciting eight-month event marketing, promotions and advertising campaign. It features an online sweepstakes, new and exciting 25th Anniversary licensed merchandise, advertising and promotions nationwide and in Transylvania, and a spectacular nationally televised anniversary celebrity karaoke and fan event, incorporating thousands of the movie's devotees, who will gather in Las Vegas to celebrate, just in time for Halloween. To generate early and widespread buzz about the 25th Anniversary release among fans, Twentieth Century Fox Home Entertainment started its eight month event marketing campaign with the February launch of a new anniversary website: rockyhorrorat25.com. This new interactive site continues to allow web surfers to obtain the latest news on 25th anniversary events, enter a sweepstakes for the chance to win a trip for six to an exclusive V.I.P. tour of Fox Studios Australia and enter to win great monthly promotional giveaways. Fox is launching a consumer print and TV campaign that reaches long time and new fans that want to celebrate 25 years of "absolute pleasure." In fact, the TV effort began earlier this year to drive awareness of, and interest in, the re-release of the film and the online sweepstakes. As part of the elaborate celebration, Fox is combining with current licensees and adding a host of new licensees for an exciting 25th Anniversary consumer products launch. Beginning in September, new THE ROCKY HORROR PICTURE SHOW 25th Anniversary themed products will be available in-stores and on-line. Licensees involved include: Ata-Boy Magnets, C&D Visionary, Entertainment Calendars, Equity Sports, Flatt World Figures, Inc., Funky, Johnson & Mayer, Inc., Kaboom, Mosquitohead, Inc., Penguin U.S.A., Inc., Simple Wishes, Taurus Corp. and Vital Toys and will include more than 100 Rocky Horror items available at all classes of retail and 25 items exclusive to the Fox Online Rocky Horror Store. • A special not-so-easily-found "Easter Egg:" View ROCKY HORROR as Richard O'Brien originally conceived. This feature starts the film in black and white (like the Wizard of OZ) and then turns to color during "The Time Warp." • The deleted musical sequences "Once In A While" and "Superheroes"
• Exciting and collectible outtakes including eleven alternate takes on key scenes in the film including "The Time Warp"
• The engrossing half-hour documentary "Rocky Horror Double Feature Video Show"
• A "Pop-Up Video" with the hot show's one-of-a-kind way of presenting Meatloaf song "Hot Patootie"
• Excerpts from VH-1's "Behind the Music: Rocky Horror Picture Show" featuring interviews with Susan Sarandon, Barry Bostwick, Richard O'Brien, Patricia Quinn and Meatloaf. THX-certified and transferred by a wide screen anamorphic process, the ROCKY HORROR PICTURE SHOW SPECIAL EDITION DVD is presented in its original widescreen theatrical format (aspect ratio 1.66:1). Packaged in a beautiful digi-pack DVD fold-out binder that features striking, rarely seen and never-before-released color visuals from the film's production, the dramatic two-disc set includes English 5.1 Surround and English Mono, and English and Spanish language subtitles. The exciting THE ROCKY HORROR PICTURE SHOW SPECIAL EDITION VHS is digitally re-mastered and THX certified for superior visual and audio quality. For the first time ever, this VHS version will contain the deleted song "Superheroes," placed back into the movie, so that audiences can experience the film as it was released in the U.K. Packaged in a striking collectible new VHS sleeve, this extraordinary SPECIAL EDITION VHS also contains the original theatrical version. The film that has grossed over $150 million (non-adjusted) at the box office follows the tantalizing adventure Janet (Sarandon) and Brad (Bostwick) find themselves on after she accepts his marriage proposal. The happy couple drive away from Denton, Ohio, only to get lost in the rain where they stumble upon the castle of Dr. Frank-N-Furter (Curry), a transvestite who is holding the annual convention of visitors from the planet, Transsexual. Frank-N-Furter unveils his creation, a muscular young man named Rocky Horror who fears the doctor and rejects his sexual advances. When Frank-N-Furter announces that he is returning to the galaxy Transylvania, Riff Raff, the butler, and Magenta, the maid, declare that they have plans of their own. 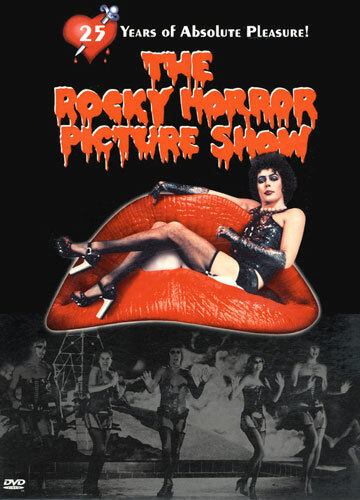 Directed by Jim Sharman ("Shock Treatment") and written by Richard O'Brien, THE ROCKY HORROR PICTURE SHOW boasts a star-powered cast including Academy Award(R) winner Susan Sarandon ("Dead Man Walking," "Thelma and Louise"), Barry Bostwick (TV's "Spin City"), Tim Curry ("Clue"), singer/actor Meatloaf ("Fight Club") and Patricia Quinn ("Monty Python's: The Meaning of Life"). Twentieth Century Fox Home Entertainment, along with Twentieth Century Fox Licensing and Merchandising comprise the retail-oriented strategic alliance of Fox Consumer Products. Fox Consumer Products is dedicated to being a forward-thinking, one-stop shopping source for all entertainment products related to Fox film and television properties, Fox Video and Fox Interactive products as well as an array of third-party programming and products. Fox Consumer Products is a unit of Fox Filmed Entertainment, a Fox Entertainment Group Company. Visit Twentieth Century Fox Home Entertainment at www.foxhome.com.